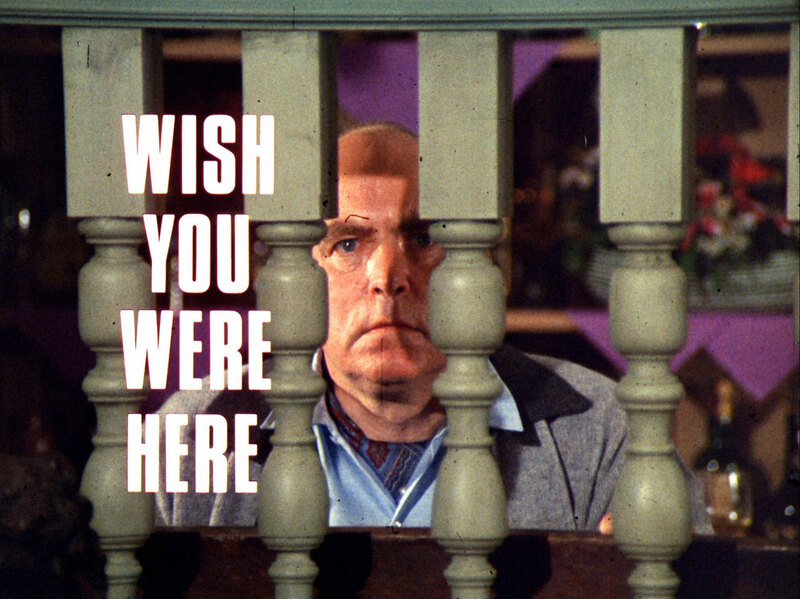 Brevitt (David Garth) tells Merrydale (Liam Redmond) he can't take it any longer, he has to escape. Merrydale says he'll never make it and suggests they plan an escape but Brevitt has made up his mind. 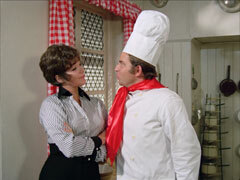 They're interrupted by Mellor (Richard Caldicot) - the maitre d'hôtel - who recommends the salmon soufflé for dinner. Brevitt leaps up and heads for the door, where the desk manager, Parker (Dudley Foster), asks him where he's going. When Brevitt declares his intention, Parker indicates his bags are already packed and asks for his room key, then presses the bell. Brevitt is relieved, and steps outside. Moments later there's a crashing noise and the busboys carry him back in, Parker apologising about the slippery top step. Steed drives Tara to her Uncle Charles' place of work - she'd been summoned by the chief clerk, Maple and advised not to arrive until after the company secretary, Kendrick, had gone to lunch. Kendrick (Gary Watson) duly appears and goes to his car and they go inside where Maple (John Cazabon) tells them Charles is still on holidays from over a month ago, but is always unreachable at the hotel. Maples goes on to say Kendrick is replacing all the staff and taking over. Kendrick suddenly appears and refutes the claim; he tenders a postcard from Charles - "Having a wonderful time, place is absolutely captivating, wish you were here" - and claims to have spoken to him an hour ago. They depart and Kendrick orders Maple into his office. Outside, Tara is still worried and decides to visit the hotel while Steed goes to see Mother. Tara arrives at the hotel and checks in. She surprises Parker by asking for Charles, who is in the lounge. Charles is overjoyed to see her - out loud - but chastises her for coming under his breath. He waits for Mellor to depart then whispers he's being held prisoner. Charles explains the hotel is a prison, but he doesn't know who's a prisoner and who's a guard. He tells her about Brevitt's attempt and Tara notices him making another one. A screech of tyres and the busboys carry him back in on a stretcher. Tara suggest co-incidence and decides to prove it - she tells Parker she won't be staying and goes to her car, but it won't start. Parker rings for the village taxi, then says he must be out. He says the bus stop is half a mile beyond the main gate and Tara declares she'll walk. Parker presses the bell and Tara has a bucket of water dumped on her by the window cleaner. Parker says she can't leave the hotel is such a state and calls Miss Craven (Louise Pajo) to take her to her room. Maxwell (Robert Urquhart) appears with a smile on his face and suggests a rubber of bridge to Charles. Charles asks him if he's able to leave and Maxwell laughs at the suggestion. Charles goes to Tara who is still unconvinced. He tells her her suitcase will now be missing and moments later the desk rings to say they were taken away in her car. 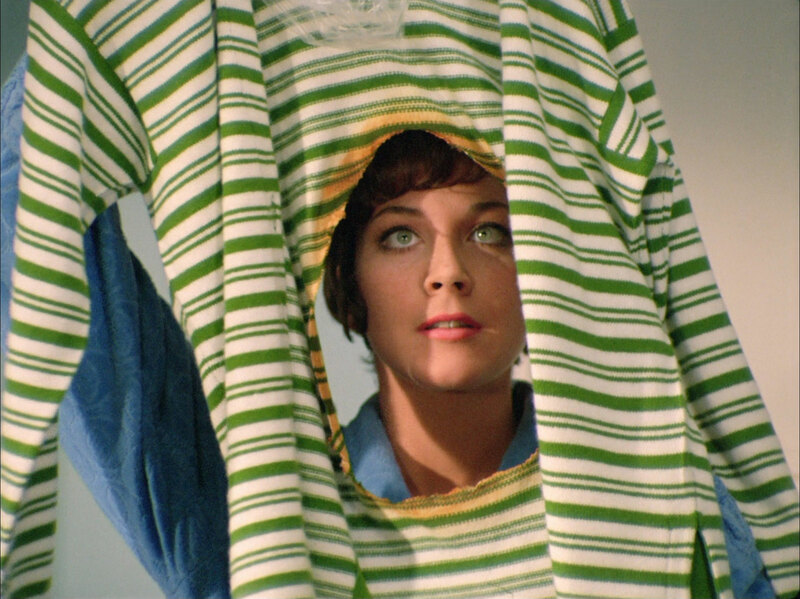 She says she'll be on her way as soon as her suit is cleaned - Miss Craven arrives with it, but the middle has been burnt out with an iron. She agrees to see Brevitt. Mother (Patrick Newell) is declaring they must unmask a double agent, surrounded by blow-ups and cut-outs of the personnel under suspicion while he spins around on an outsized pair of scales while Rhonda (Rhonda Parker) stands impassively by. Mother wants Tara's analytical mind on the case and is infuriated to learn she's taken a holiday. He's more infuriated a moment later when his nephew, Basil (Brook William), sinks a golf ball in his whisky. 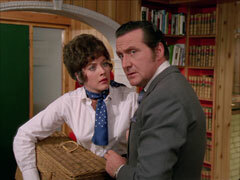 Steed is dispatched to look into a hit and run case, whom he discovers to be Maple. Tara meanwhile has changed and discovers Brevitt's body in his room. She and Charles decide they must tell the outside world and Charles nominated Maxwell as someone they can trust. 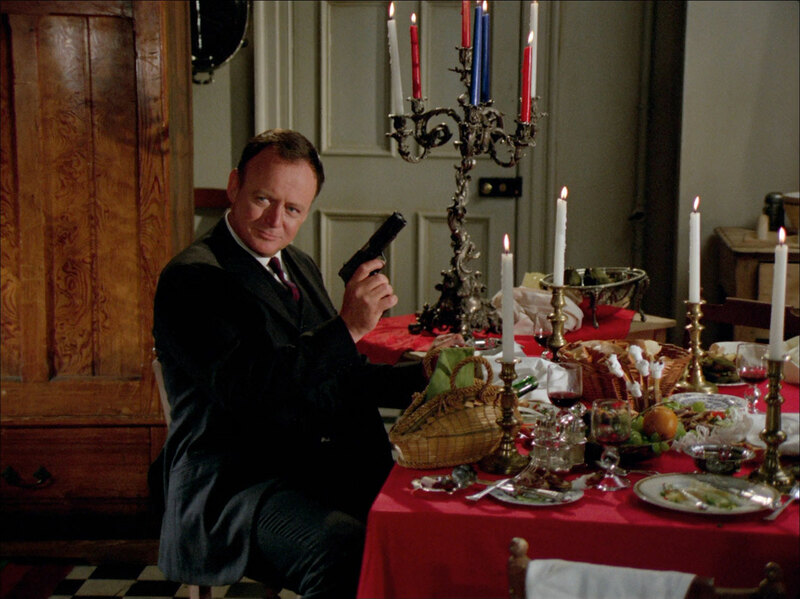 He's taken to Brevitt's room but Vickers (Derek Newark) is now lying on the bed. He fights off Tara when she tries to roll him over. Parker enters and tells them Brevitt checked out a few minutes ago and left the hotel. They nominate Maxwell to try to leave the hotel. Tara asks her uncle if they can really trust him then wonders if Maxwell might now be under suspicion. Maxwell staggers to their table a few moments later, saying someone had left a rollerskate on the steps, and his car has been stolen. They plot an escape over the pool table, planning to use the laundry chute in the morning to stow away in the milk truck. Steed hangs up the 'phone and tells Mother he's now been given five excuses for why Tara can't come to the 'phone - one was she was in the pool, but the Elizabethan has no pool. He tells Mother about Maple's connection to Tara's uncle and Mother decides to send Basil to the hotel. Tara meanwhile slides down the laundry chute, preparing to escape while Maxwell guards the service entrance but before she can leave the room her uncle slides down, knocked out cold. In the morning, Charles remembers nothing and asks where Maxwell was at the time; Tara says he helped carry Charles to his room and Charles despairs at ever escaping now. 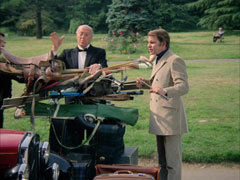 Basil arrives in a little vintage car, jam packed with different sporting equipment (sound familiar? ), infuriating Mellor who has to cart it all inside. 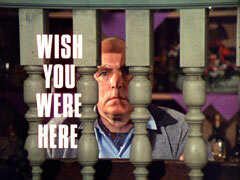 Basil enters the hotel and "introduces" himself to Tara, who's on the terrace, being watched by Vickers. He's a bit baffled when she makes him pretend to tell her a story and she tries to tell him about the hotel staff preventing her departure. She decides to prove it to him and leads him to the front desk, where she loudly says she hadn't realised he'd come to see Charles. She challenges him to leave and he discovers all his tyres are flat, then has a bucket of paint dropped on him. Kendrick arrives to ask Parker to eliminate Charles altogether, he's willing to pay them well for the service. 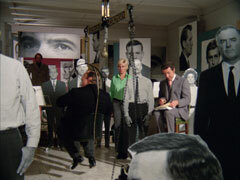 Vickers says they killed Brevitt, so why not - then he spots Basil making a break for it. Basil is chased by two busboys but is captured when an attractive girl (Sandra Fehr) in the woods claims to have caught her foot in a trap; Mellor clubs him when he goes to help her. 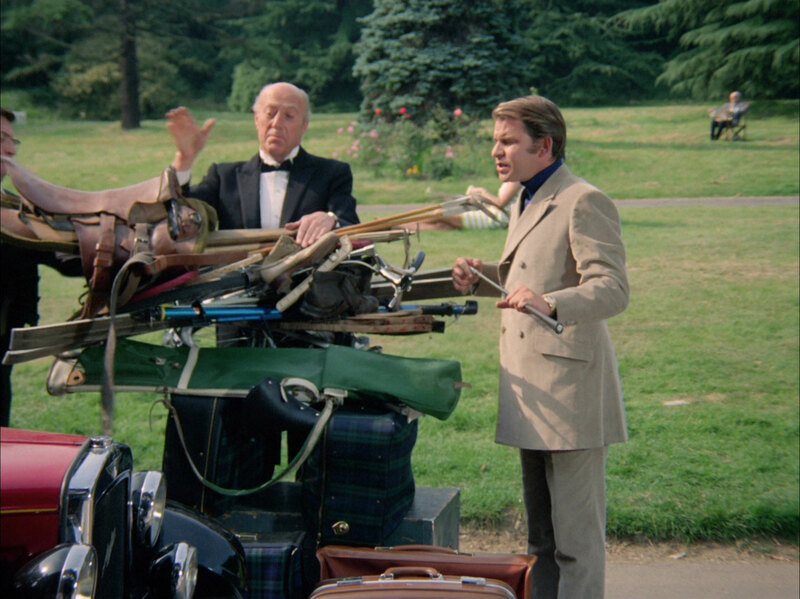 Back at the hotel, Maxwell is surprised to learn Basil has escaped, and Merrydale is celebrating his success - then Basil staggers in, saying one of the staff told him a tree fell on him. Basil apologises for doubting Tara, saying it's like no prison he knows - no locked doors, bars or warders. Tara muses that letting them run about loose may be the villains downfall - she says "when the enemy thinks you're beaten, that's the time to attack" and drags Basil off to the front line - the kitchen. Kendrick signs the contract for Charles' death, but amends it to include Tara as well. Parker is reluctant but Vickers agrees and the deal is done. Tara meanwhile knocks out the chef and Charles and Maxwell barricade the kitchen. Tara turns off the water mains and asks, "Whoever hears of an hotel without water or food?" The staff are trying to force the kitchen door open as our quartet sit down to dinner, before sitting down, Tara throws the main power switch, plunging the hotel into darkness. Miss Craven runs in to tell Parker all the guests are leaving - he is powerless to prevent their departure as all his men are engage in trying to enter the kitchen. Tara toasts their success - now the only people in the hotel are their enemies. Kendrick storms in, angered at the turn of events and saying Parker's contract offered normality. Vickers knocks him out for wanting to back out, then Tara starts flickering the mains to signal SOS. It's a diversion though - Parker draws off all his men to turn off the lights and Tara takes her chance. 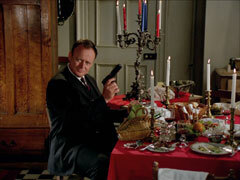 Maxwell chooses that moment to show his true colours and pulls a gun on them. He reveals himself to be the mastermind behind the hotel but his arrogance is his downfall - Tara knocks him down with a serving trolley and knocks him out. Tara plucks the hotel safe key from Maxwell pockets and they realise they now have the upper hand - she and Basil head for the manager's office, dispatching two waiters on the way, and steal the contents. When Parker enters his office with Vickers and Craven, they think Maxwell has made off with the loot and head for the front door, when Tara scones the lot with a frying pan - Basil had repolished the step. Maxwell comes to and knocks Charles down then heads for the front door. He leaps over the top step and gets into a car, but find the tyres are all flat. He rushes for a bicycle down the side of the hotel and is ambushed with a bucket of paint and a banana peel. Steed finally arrives in his Rolls and requests a room for a weary but successful viper hunter. He tells Tara her holiday has done her a world of good, and she declares she wants to come back - to have a long, long rest. Steed listens carefully at a door in his apartment. the doorbell rings - it's Tara, whom he cautions to be quiet. she shows him the picnic hamper she's brought and he tells her they have to postpone it - he can't leave the apartment. She's startled to learn he's being held a virtual prisoner and rejects his suggestion she come back later. He's pleased by her offer to hold the fort alone and says he's off to the pub - she can mind the neighbour's baby until he gets back.